The traditional Linux security model starts with file permissions. The model lets the kernel decide whether or not a process may access a resource based on permissions set as part of the filesystem. The coarse-grained granularity of this model often causes Linux processes to have too many rights. If more granularity is needed, one has to resort to adding security related code into the program source. This series of articles is about Linux namespaces, a lightweight virtualization technology implemented in Linux kernel. In part 1 I’ve talked about building chroot jails using mount namespace, and in part 2 I’ve looked into isolating processes using PID namespace. 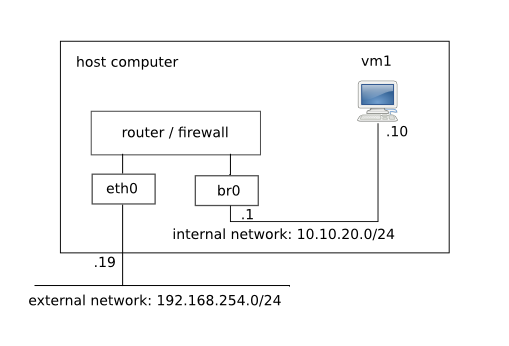 The next step is to isolate the TCP/IP networking stack using network namespaces. Security at this level is always reactive. Assuming the bad guy breaks into your server, he will realize he doesn’t have root privileges (classic Unix privilege separation implemented in server software), he runs on top of a fake filesystem (chroot), and he cannot get outside on the network. The later is usually done by placing the computer in a Demilitarized Zone (DMZ) behind a firewall. This entry was posted in Linux, Networking, Programming, Virtualization and tagged bash, C/C++, Debian on February 1, 2014 by netblue30. Namespace isolation is the simplest virtualization technology available in Linux kernel. It allows a process and all its descendants to have their own private view of the globally shared kernel resources, such as the network stack, process table, mount table. This feature is mostly popularized and promoted by utilities such as LXC (Linux Containers), Docker and virtenv. Three syscalls are used to create Linux namespaces, unshare(), clone() and setns(). In this article I will take a look at unshare() and show how to use it directly in your scripts and programs without going through LXC or any other higher level virtualization tool. I’ll start by investigating unshare command available in util-linux package, and from there I’ll move to the system call. In the end I’ll build a small C program that isolates a web browser such as Mozilla Firefox into a kernel namespace. This entry was posted in Linux, Programming, Virtualization and tagged bash, C/C++, Debian on January 3, 2014 by netblue30. SendEmail is a lightweight command line SMTP agent. It was designed to be easily integrated in bash scripts, Perl programs etc. The program is in fact a Perl script, and it is distributed under GPL license. This is how you can send emails from command line using SendEmail and a regular gmail or yahoo account. This entry was posted in Networking, Programming and tagged bash on February 17, 2013 by netblue30. ezchroot is a small script to chroot into OpenVZ containers. Once inside, you can update or modify the container software. The operation is similar to ezlxc. This entry was posted in Programming, Virtualization and tagged bash on February 2, 2013 by netblue30. This entry was posted in Programming and tagged bash on November 18, 2012 by netblue30.